PROS: Easy. No Expertise needed, what so ever. Just run it, follow the wizard. VERDICT: If you are looking for a simple solution to create bootable Setup disks. This is the tool for you. It takes no more than 5 minutes to complete. I know, there are many solutions on how to create a Bootable Installation Disk for Windows. In a post (not too long ago) Rich showed you how to do exactly that – “the old-fashioned way” (Read it Here). Now I bring you a great piece of freeware to do the job for you: WinToFlash. Don’t get me wrong, the “old school” still works, and good too. But if you feel uneasy using tools without a familiar GUI interface, then WinToFlash is the way to go. Win2Flash is still in beta and does not (yet) come with an installation package. Simply Unzip the files to a folder and you are set. Win2Flash has two options: Wizard and Advanced. The Advanced settings allows you to control how your Flash Drive is formatted, which windows version to use and so on. For most users, the wizard will suffice. After you unzip the Win2Flash software, insert the Windows Setup Disk and connect your USB Flash Drive. In the Basic Parameter Window, choose the Windows Files and Flash Drive Path. Now Win2Flash will ask to format your Flash Drive and start copying the setupfiles. Close the application when done (There is no Exit Button). And that is it. WinToFlash takes no more than 5 minutes to complete, giving you a hassle free Flash Drive Setup Disk. I used wintoflash with Windows 7 32bit Home Premium with a laptop, worked really well. What about slipstreaming a SP onto it as most of us only have the original W7 dvd. This is great stuff but it is of no use to those of us who bought a computer with Windows pre-installed and no CD provided. I may be wrong but I think a majority of people requiring a painless process like this are the very people that don’t have an installation CD. I haven’t looked into it enough but wonder if using a downloaded (legitimate) copy of Windows 7 with your own license key would work? http://forum.mintywhite.com/viewtopic.php?f=24&t=5865 I suppose this isn’t the OEM copy and haven’t had a chance to test it myself but it can be something that someone else may want to pursue? Ahh.. well Bardrow – here’s the clue. 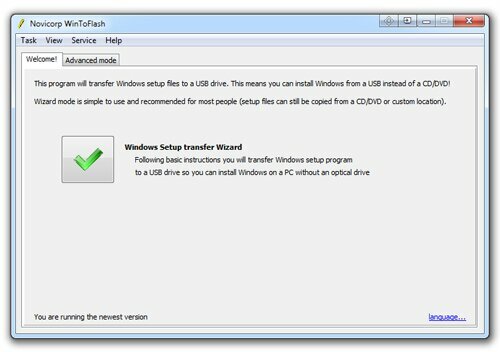 Even if your computer comes pre-installed with windows, you still have a copy of your windows setup available on a hidden partition on your computer. Most pre-installed computers have a “reset” functionality that restores your windows back to factory settings. This of course is hidden. I’ll write an article on it, but a hint is to use the Diskpart tool to unlock it.